The U.S. containerboard operating rate was 89.5 percent in February 2019; 6.2 percentage points lower than the same month last year and down 3.9 points year-to-date. March 19, 2019 - The American Forest & Paper Association has released its February 2019 U.S. Containerboard Monthly report. According to the report, containerboard production decreased 1.8 percent compared to February 2018 and was down 1.4 percent year-to-date. The average daily production compared to January 2019 was 3.8 percent lower. The containerboard operating rate was 89.5 percent, 6.2 percentage points lower than the same month last year and down 3.9 points year-to-date. Production for export continued its steep decline and was nearly 30 percent lower than February 2018, dropping below 300 thousand short tons for the first time since May 2010. The report can be purchased by contacting Statistics_Publications@afandpa.org. 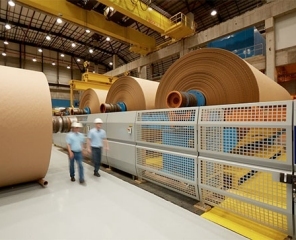 The American Forest & Paper Association (AF&PA) serves to advance a sustainable U.S. pulp, paper, packaging, tissue and wood products manufacturing industry through fact-based public policy and marketplace advocacy. AF&PA member companies make products essential for everyday life from renewable and recyclable resources and are committed to continuous improvement through the industry's sustainability initiative — Better Practices, Better Planet 2020. The forest products industry accounts for approximately four percent of the total U.S. manufacturing GDP, manufactures approximately $300 billion in products annually, and employs nearly 950,000 men and women. The industry meets a payroll of approximately $55 billion annually and is among the top 10 manufacturing sector employers in 45 states. Visit AF&PA online at www.afandpa.org or follow us on Twitter @ForestandPaper.